BREAKING: Catalonia Declares Independence - Joe.My.God. In a major escalation of Spain’s territorial conflict, Catalan lawmakers declared independence on Friday, setting up a showdown with the central government in coming days. Undeterred by the government’s threat to seize control of Catalonia, separatists in the region’s Parliament passed a resolution to “create a Catalan republic as an independent state.” In protest, lawmakers opposed to independence walked out of the chamber before the vote. Earlier on Friday, Prime Minister Mariano Rajoy urged the Spanish Senate to invoke Article 155 of Spain’s Constitution, allowing him to impose direct rule on Catalonia, as the country’s careened into its greatest constitutional crisis since it embraced democracy in 1978. Following a request from one of the pro-independence MPs, parliament speaker Carme Forcadell read part of the preamble from the motion, in which a declaration of independence is made. The vote then took place, resulting in 70 votes in favour of approving the text, ten against and two blank votes. Opposition politicians from Citizens and the PP left the chamber before the vote in protest, and did not take part. 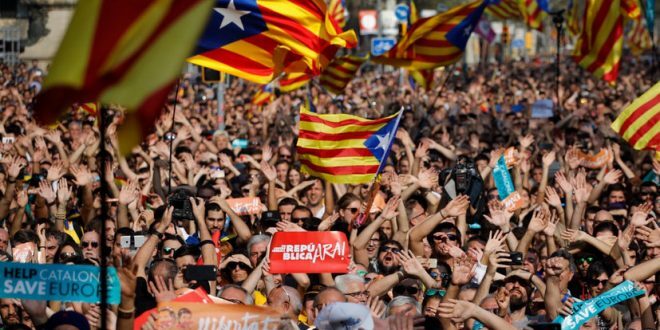 Separatists who had gathered on the streets of Barcelona and near the parliament building celebrated as the news of the vote came in. PM Rajoy reacted almost instantly to the vote on Twitter, asking Spaniards to be “calm” and insisting that “legality will be restored in Catalunya”. Catalonia is now a Republic; not a Monarchy anymore. No more subjects; just Citizens, Free Citizens.